The House and Senate adjourned the 2017 legislative session for good at sunset Wednesday, capping a day that saw lawmakers expand tax breaks for businesses and benefits for poor Arizona families. In the Senate, lawmakers gave final approval to a bill to restore two-year eligibility for cash assistance for needy families, the way it was before Gov. Doug Ducey signed legislation that cut the limit by half two years ago. The slog of voting Wednesday morning and afternoon finished a session that could have dragged on even longer, were it not for a deal struck Tuesday in the Senate on a bill to consolidate election dates. 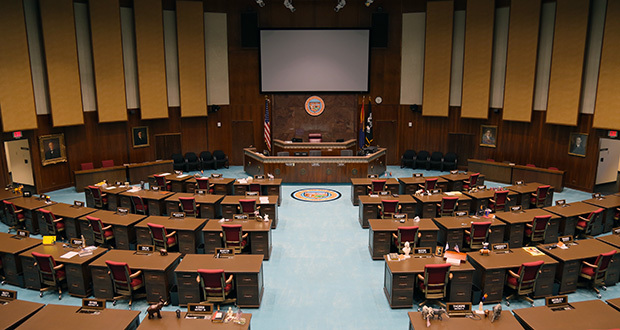 SB1152, pushed by Rep. Kevin Payne, R-Peoria, is intended to spark a lawsuit against the state of Arizona after lawmakers lost a previous legal battle over their right to consolidate elections at the Arizona Supreme Court. It may not have been a significant policy issue for most lawmakers, including Senate President Steve Yarbrough, R-Chandler. But Yarbrough noted that SB1152 was a critical part of getting enough support to approve a $9.8 billion budget a week ago, and the Senate needed to fulfill its obligation to pass the bill. “Once the commitment was made to get it up there, that became the problem,” Yarbrough said. Senate leadership was prepared to call upon Sen. John Kavanagh, R-Fountain HIlls, to fly back to the Capitol on Thursday from a week-long teaching course in Louisiana, with plans for a late-night vote on several bills shortly after he landed in Phoenix. Instead, Sen. Kate Brophy McGee, R-Phoenix, reached a deal that ended her opposition to the bill. Her decisive vote on SB1152 allowed the Senate and House to move along and adjourn sine die on Wednesday, and in rare fashion — the last time the Legislature finished its work in the light of day was June 19, 2003. The big action left for Wednesday was the decision to provide even more financial incentives for manufacturers, some of whom already get special property tax treatment and a few of whom may be paying no state corporate income taxes at all. Yarbrough did not dispute that existing laws and what is in SB1416, approved by the Senate on a 21-6 vote, and the House by a vote of 32-21, will minimize what some companies pay not only to the state but also in local property taxes that support the city and school districts. The Senate president said that has to be weighed against the promise by Intel it will invest more than $7 billion to refurbish and finally occupy a now-vacant chip-manufacturing facility it built years ago in Chandler, Yarbrough’s hometown. That, he said, will create new revenue streams. “You’re missing all of those people who have jobs at Intel who make six-figure salaries, who pay income tax, who pay property taxes on their home, who pay sales taxes at all the places they buy stuff,” Yarbrough said. But House Minority Leader Rebecca Rios, D-Phoenix, said the record in Arizona disproves the theory that tax breaks for business will grow the economy. “Where’s all this revenue that’s flooding into the state?” she asked. Rep. Pamela Powers Hannley, D-Tucson, took particular issue with provisions of the bill that extend special tax credits to firms to reimburse them for the cost of doing research and development. The state is forgoing millions of dollars of taxes, and that’s not the worst of it, she said. “This bill also gives away millions of dollars in research royalties into the future, with no end date,” Powers Hannley said, research that was financed by taxpayers in the first place. Not all Democrats were opposed. “Not only will SB1416 create thousands of high-paying jobs to thousands of Arizonans, but will catapult economic development in the right direction,” said Rep. Cesar Chavez, D-Phoenix. He said graduates from the state’s three universities are “fleeing” because there are not enough jobs available. House Speaker J.D. Mesnard, R-Chandler, reflecting a philosophical difference between the parties, took particular issue with Rios’ contention the state is giving away tax breaks. The money, Mesnard said, belongs to the taxpayers. The provisions in SB1416 come on top of the special tax treatment that certain large corporations already get. There are those research developments tax credits, which can be equal to 24 percent of what a company spends. Arizona also has created “foreign trade zones,” where the property tax on businesses is just a fraction of what it is on firms whose facilities are located elsewhere. Multi-state corporations are allowed to compute what they owe in Arizona corporate income taxes based entirely on what percentage of the products they make are sold in the state. That potentially reduces the liability to manufacturers whose products are made here and shipped elsewhere. That break is even more significant for firms like Intel, whose computer chips are sold to other firms nationally and worldwide, and Raytheon which has little Arizona audience for its missiles. SB1416 makes three major changes in existing laws. It would extend and expand tax credits manufacturers already get for creating new jobs. That credit is currently set to expire at the end of June. Another provision extends the tax credits available for expenses on research and development. And it would create an accelerated depreciation schedule for any equipment purchased by manufacturers. That break relates to the fact that Arizona law imposes property taxes not only on land and buildings but also any business equipment, from major presses to computers and desks. The value of that equipment is based on the purchase price, a figure that is adjusted annually for depreciation. SB1416 allows businesses to write off half the value in the first year alone, a move that provides an immediate break on what already is a reduced property tax rate. That will particularly help companies that are currently in the market for major new equipment, like Intel. Ducey has generally been favorable to new business tax breaks. But he’s also getting something in the legislation he did not want. Rep. Jill Norgaard, R-Phoenix, slipped in language which says that the sale of partial ownership shares of corporate jets is not subject to the state sales tax. Ducey vetoed a bill with only that language earlier this year because of the revenue implications. But he will have to accept it if he wants the rest of what’s in SB 1416 because he lacks the constitutional power to excise provisions of new laws he does not like. There was no immediate response from his office to what Norgaard had done. “House Speaker J.D. Mesnard, R-Chandler, reflecting a philosophical difference between the parties, took particular issue with Rios’ contention the state is giving away tax breaks.